A senior opposition politician in Nigeria has begun legal action to try to force the country's sick president to step down on health grounds. President Umaru Yar'Adua has been seriously ill in hospital in Saudi Arabia for a month. Farouk Adamu Aliyu of the All Nigeria People's Party has asked the federal high court to rule whether the president has the capacity to govern. Doctors say President Yar'Adua is suffering from acute pericarditis. The condition is an inflammation of the lining of the heart. 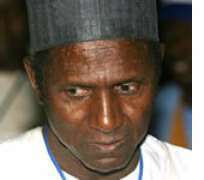 Mr Yar'Adua has not formally handed over power and as a result Nigeria is locked in a political impasse. The BBC's Lagos correspondent says a ruling from the court would help bring clarity to the situation in which wild rumours have swept the country. These rumours have included claims that the president is in a coma, or that he has been struck dumb. Ministers have said the president is responding to treatment and have asked Nigerians to pray for his recovery.